Region – When you walk into Watermark Antiques & Gold, in West Boylston, you never know what you’ll find – a giant leather giraffe, an antique slot machine, or an oil can from the 1940s. Whatever you find, you can be sure that it’s authentic, unique and fairly priced. Owner Mark Alzapiedi has more than 30 years of experience in buying, selling and appraising antiques, jewelry, watches, and gold and silver coins. 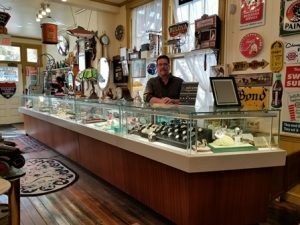 He opened Watermark Antiques 15 years ago after deciding to go into the business full-time. Before that, he was an engineer in the high-tech industry, while antiquing on the weekends. Alzapiedi said he first became interested in antique radios during the craze of the late 1980s. “I just loved the look of them,” he said, adding that he then expanded into other types of antiques. During his three decades in the business, he has become very knowledgeable about almost everything vintage or antique. And what he doesn’t know, he will happily research to discover the origin and market value. For specialty items such as quality luxury stainless steel and gold watches and distinctive jewelry pieces, Watermark has a large network of dealers and collectors who buy from them on a regular basis. In addition to purchasing antiques, collectibles, watches and jewelry, Watermark is the biggest gold and silver coin buyer in central Mass. While the value of gold is not as high as it was during the boom of 2011, it is still “the lifeblood of the business,” Alzapiedi said. Watermark’s building at 18 North Main St. (Route 140) is itself an antique: it was first an 1860 schoolhouse, then a post office and appliance store, before becoming an antique store for the last 60 years. The showroom is full of high-end pieces, including advertising signs, toys, art, musical instruments, jewelry, silverware, antique firearms, clocks, pocket watches, lighting, collectibles, pottery, old papers and ephemera. Alzapiedi has particular expertise in evaluating quality estate items such as Cartier, Tiffany, Rolex and other premium luxury brands. At all times, Watermark has a full selection of quality watches, along with modern and vintage jewelry available for purchase – perfect gifts for that hard-to-shop-for loved one. Watermark has a watchmaker and clockmaker to restore and maintain specialty timepieces, and they can custom-make jewelry from heirloom rings or other items. “Watches are super-hot right now,” Alzapiedi said. Large stainless steel “tool watches” used for diving and racing are especially desirable now. “And using heirloom gems in new settings or modifying an old ring is also very popular,” he added. Alzapiedi recommends calling before visiting as hours are Monday and Tuesday by appointment. They are open for business, Wednesday to Saturday, 9:30 a.m. to 5 p.m.